Decks are a beautiful and functional addition to any home. They can be a great, inexpensive extension of your indoor living space. But they're also a feature that requires regular maintenance if you want to keep them looking good. Decks take a tremendous amount of harsh treatment from the elements. As with any horizontal surface, they get a lot of exposure to the sun's UV rays. Combining that with the constant barrage of rain and snow that lays on the wood's surface as well as a steady stream of foot traffic makes them possibly the most heavily-abused area of your home. In spite of that, a properly cared-for deck will last you for many years. But there's more to the seasonal upkeep than slapping-on the occasional coat of stain. Assuming your deck is made of pressure treated wood instead of the new composite type of decking -- which requires less maintenance but lacks the charm and attractiveness of wood -- following these few simple steps and making the right product choices will extend the life of any deck refinishing project. Cleaning your deck is vitally important - not only for the purpose of removing the layers of built-up dirt and mildew, but also to help restore the wood to its natural color. Now, there's some debate when it comes to the best way to clean a deck. Pressure washing the wood surface is certainly a quicker and easier way to get through the labor-intensive step of cleaning. However, an inexperienced operator of a pressure washer can can actually do more harm than good when trying to clean a bare wood surface. Things like using the wrong nozzle, holding the wand too close to the surface, washing at an incorrect angle, or concentrating the water in one area for too long can cause significant damage to the wood fibers and lead to expensive repairs. Excessive or incorrect water infusion into wood is often the culprit behind chipping, splintering, warping, cupping, and splitting that are so frequently seen on prematurely aged wooden decking boards. No matter how well-intentioned, we always recommend that homeowners err on the side of caution and leave deck pressure washing to the trained professionals. The good news is that you can still effectively clean and restore your deck without having to break out the heavy equipment. Mix a concentrated deck cleaner/restorer with water per the manufacturer's instructions. Thoroughly wet all of the surfaces to be cleaned with a garden hose. Liberally apply the cleaner with a pressurized (pump-up) sprayer. Allow the cleaner to sit on the surface for a few minutes and then scrub the boards, spindles, and handrail with a stiff bristled, long handle deck brush; working in the direction of the wood grain. Using your garden hose, thoroughly rinse the surfaces to wash away the dirt and cleaner residue. If your deck is located in an area where algae tends to grow on the surface of the wood you can mix some borate at a ratio of 5 parts water to 1 part borate in a mixing bucket, using a drill with a mixing attachment. Apply the borate solution to the damp surface with your pressurized sprayer and do not rinse off. Allow the wood to completely dry for approximately 2-3 days before proceeding to the next step. Depending on the age and condition of your deck there may be some additional steps required before you start applying your stain. Set Nails/Screws - Over time the fasteners that secure your decking boards to the frame tend to work their way loose. It's a good idea to scour the surface and recess any protruding nail heads or screws just slightly below the surface. Sanding - If the wood is weathered or your cleaning work caused the wood grain to raise you may want to consider giving your deck a sanding so it's not so rough when you walk on it with bare feet. Using an electric sander, start with a course grit for your first pass. For the final pass use a medium to fine grit to finish it off. Once you're done with your color selection you'll just need to choose the product that best fits your needs. When it comes to stain selection you have several choices. Clear Sealer - Some people prefer to maintain the natural wood look and opt for a clear protective sealer. Know that if you go this route you will be adding the least amount of protection to your deck and you'll have to re-coat it often - probably every year depending on the amount of wear it gets. Semi Transparent Stain - If you're looking to add some color to the deck but still want to be able to see the wood grain then a semi-transparent stain is your best option. As opposed to the clear sealer, just adding some pigment to the wood will serve as a protective barrier between the deck and the elements. It will also keep you from having to re-coat as often - probably every 2-3 years or so, depending on the amount of wear it gets. Solid Color Stain - Solid stain looks very similar to a flat paint when it is applied, so it will cover up much of the wood grain. It will also give you the most protection for your deck and last the longest. You can expect to get 2-5 years of life out of a solid color stain depending on the wear. But unlike clear sealers and S/T stains, solid color stains will peel. No matter which type of stain you choose there are some best practices you should follow when applying it. Use a pressurized sprayer, roller, or wide staining pad to get the material onto the deck surface to speed up the application process. Make sure you protect any surrounding areas from overspray or spatter with plastic sheeting. 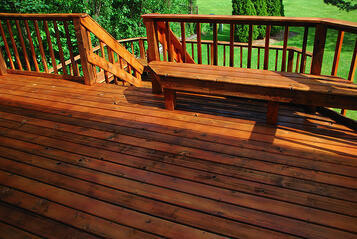 Once the stain is on the surface use a deck staining brush to work it into the grain of the wood. Work in small sections at a time when you're applying and back-brushing in order to maintain a wet edge. Apply the stain in the same direction as the grain of the wood, working your way down the length of the boards in an area that is about 5-6 boards wide with each pass. This way if you have to stop before the deck is completed you can finish the length of boards you're working on without having a stopping point in the middle of the boards - avoiding any lap marks. Follow the manufacturer's instructions when it comes to the number of coats you should apply. In many cases one coat will be sufficient, unless the wood is old or weathered and quickly absorbs the first coat. Some products warn that when applying multiple coats it can actually create a sheen on the deck surface, causing it to become slick. If you're deck was just recently built, it is recommended that you wait 6-12 months for the wood to weather before staining for the first time. Once your deck refinishing project is completed all you need to do for maintenance is to give it a good gentle cleaning each Spring/Summer. Then, as it wears, refinish the surface again as necessary every few years depending on the type of stain or sealer you apply. 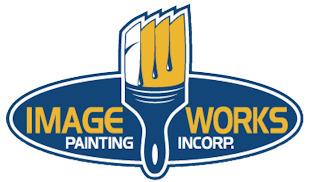 If you're in the Greater Pittsburgh or Western Pennsylvania areas and have a deck refinishing project that you need assistance with, please contact us for a free consultation and quote.